A Pacific Blue pilot charged over the after dark departure of flight DJ89 from ZQN-SYD last year has pleaded not guilty to charges stemming from the event. The airline itself has not been charged in relation to the incident - hence why I have not included their logo in this post. Qantas is set to suffer from strike action next week as engineers in Melbourne begin rolling stoppages from Monday. The strikes have the potential to have a massive impact during the busy school holiday period. In a unique move the union that is striking has offered Qantas the use of its members who are not rostered on, on that shift as long as Qantas pay them double time for coming in to work to cover their rostered colleagues who are partaking in the rolling stoppages. Qantas labelled the offer a "cynical stunt" as the engineers would have to be paid a minimum four hours each. "No Australian company would pay staff four times their normal rate to go on strike," said Qantas group executive of operations Lyell Strambi. Qantas have today cut its previously planned flight growth and is deferring or cancelling delivery of new aircraft, in response to slow growth in domestic traffic. Perth is the latest Australasian city to fall foul of the ash clouds, with Virgin Australia, Qantas, Jetstar and Tiger announcing cancellation of services to and from the city, with Air New Zealand and Skywest expected to follow suit. The ash cloud effecting Perth is at a lower altitude 15000ft causing the cancellation of services from Virgin Australia and potentially Air New Zealand. The latest cancellations cap off a four-day long travel crisis, in which tens of thousands of travellers have been stranded. Airport terminals have turned into scenes of utter chaos as passengers deal with the fall out of volcanic ash from the Puyehue-Cordon Caulle volcano in Chille. Trans-tasman and domestic flights in New Zealand have been cancelled as have domestic flights to Tasmania and now Melbourne. The first glimpse of the new regional aircraft in Virgin Australia colours. 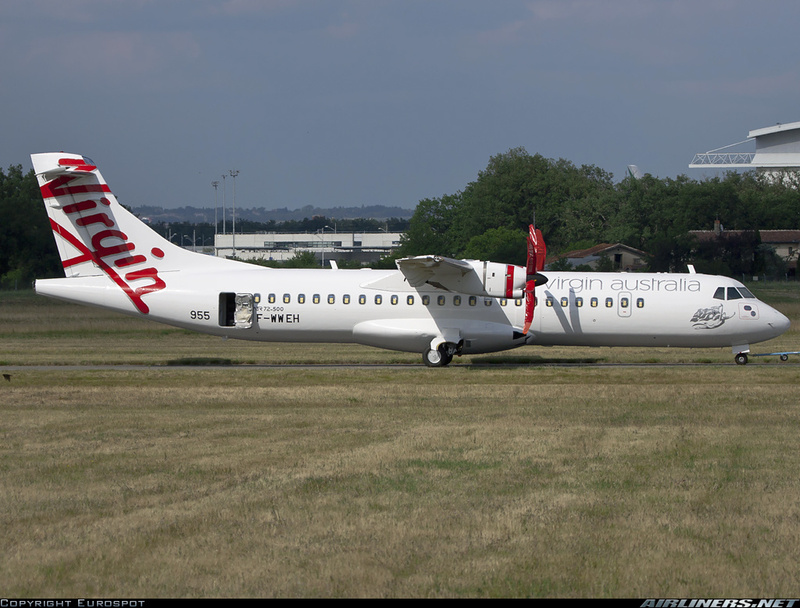 The ATR 72-500, soon to grace regional Australian skies. Qantas are sponsoring Malaysian Airlines for entry into the oneworld alliance with the process expected to take 18 months to complete. At the same time Qantas and MAS will look at options for co-operation on Asian routes, and how they can help each others market share. In a move that will strengthen the rumours about Virgin Australia's possible entry into the Star alliance, Virgin have announced their Asian partner will be Singapore Airlines. Virgin now have significant partnerships with two Star Alliance partners Air New Zealand and Singapore Airlines. It has long been speculated that Air New Zealand would sponsor Virgin for entry into Star, and now with two firm partnerships it looks possible that Virgin may go the way of star. Virgin CEO John Borghetti speaking at the partnership with SQ launch has stated that entry into Star isnt something they are contemplating at the moment and is something that they may look into in 2012 or later. Step 1 of the long awaited and anticipated revamp of the Virgin Australia Velocity rewards program has begun, with Virgin Australia announcing changes to the way frequent fliers earn status credits. Fliers now only need to earn 250 credits to qualify for Silver level and 200 to maintain it, in the new rolling 365 day period. For Gold Level membership fliers need 500 credits to qualify and 400 to maintain. Australian domestic player Regional Express (Rex) has threatened to cut domestic services to regional NSW and VIC siting the federal governments lack of support for regional air services as a significant factor. "The very high fuel price is making the situation quite untenable and all airlines are compelled to put in place rigorous measures to remain profitable,’’ Rex executive Chairman Lim Kim Hai said. Flights from SYD to Taree, Grafton, Moruya and Bathurst, and from MEL to Griffith, Merimbula and King Island are under threat. Qantas yesterday introduced their new charging system for domestic baggage, changing from the old weight based charge to the new number of bags charge. Although this change was announced last October it has caught many by surprise as it hasn't been widely advertised, and was suddenly implemented yesterday. The first piece of luggage (up to 23kg) will continue to be free, while the second piece will cost $15 if booked online or $30 at the check in desk, while the third and subsequent pieces will cost $60! Passengers will also be slugged a $20 heavy fee if the bag is between 23-32kgs. The airline has also changed its international charges to a piece-based system, but has not reduced luggage limits and has increased weight allowances for frequent travellers. No not some dodgy sequel from hollywood, but an odd problem for Qantas, who were forced to ground one of their domestic 767 aircraft in Sydney yesterday after 5 rats were found in the cabin. The rats were found in emergency medical equipment just before passenger were due to board. Qantas do not know where the rats came from or how they got on board. The aircraft was grounded while engineers killed the rats and checked to see they hadn't damaged any wiring, passengers were delayed slightly while the aircraft was swapped.